Madrid (Spain) – October 17, 2018 (travelindex.com) – The UNWTO Conference on City Breaks, Creating Innovative Tourism Experiences (15-16 October 2018) concluded in Valladolid, Spain, with a call for cities to become smart tourism destinations, where tourism governance and the digital economy mesh together to offer travellers diverse and authentic experiences. The conference brought together tourism leaders from the public and private sectors to analyse how to respond to the growing trend of city breaks as leisure experiences. They concluded that public-private partnerships, the inclusion of local communities and the creation of smart destinations are crucial for urban destinations to gain the knowledge and define the policies they need in order to respond to the new demands of hyper-connected and hyper-informed tourists. The Deputy Director-General for Tourism Development and Sustainability of the Ministry of Tourism of Spain, Ruben Lopez Pulido, suggested that cities and all destinations change their models of tourism development to respond not only the most demanding tourists, but also to the rise of the digital and knowledge economy. “Being a smart destination is not just a label, but a process towards the comprehensive transformation of destinations, while always aiming at the achievement of the Sustainable Development Goals,” he said. Speakers at the conference included Dieter Hardt-Stremayr, President of European Cities Marketing and CEO of the Graz Tourism Office in Austria, who described what he considered key challenges for the growth of city breaks: transportation issues, seasonality, and the dispersion of tourism demand within a city and over time. “Our main challenge is to attract visitors to come right at this moment. To overcome it destination managers should focus on parts of the tourism offer that are ‘temporary’,” he concluded. The main conclusions of the conference referred to urban tourism governance models. Participants highlighted that, with the growth of high-speed, low-cost transportation links that provide more and more visitors with access to city breaks, city destinations must respond by prioritizing investments that benefit residents and tourists alike. They also concluded that with the technological advances that allow the creation of smart destinations, destination management organizations must shift their focus from only promoting the experiences available for tourists in cities, to managing urban tourism in all its complexity. For their part, tourism policy makers should use smart destination tools to study the impact of tourism on the profitability and sustainability of a city, and place the destination at the centre of policy changes. These conclusions will be taken into account in the UNWTO work plan on urban tourism. 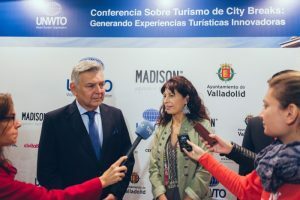 The Conference was organized by the UNWTO in collaboration with the City Council of Valladolid and the marketing agency MADISON, an Affiliate Member of the UNWTO. Other speakers included representatives from Madrid Destino, San Sebastián Turismo & Convention Bureau, Ljubljana Tourist Board, Turin Convention Bureau, Lisbon Tourism Observatory, Municipality of Alba lulia (Romania), Google, TripAdvisor, Basque Culinary Center, World Heritage Cities of Spain, AMFHORT, European Historical Association of Thermal Cities, Innova Tax Free, Thyssen-Bornemisza Museum, Thinking Heads, Segittur, Civitatis, Authenticitys and Amadeus, as well as journalists Xavier Canalis of Hosteltur and Paco Nadal of El Viajero (El País newspaper). The World Tourism Organization (UNWTO), a United Nations specialized agency, is the leading international organization with the decisive and central role in promoting the development of responsible, sustainable and universally accessible tourism. It serves as a global forum for tourism policy issues and a practical source of tourism know-how. Its membership includes 158 countries, 6 territories, 2 permanent observers and over 500 Affiliate Members. Follow us on Facebook, Twitter, Instagram, YouTube, LinkedIn and Flickr.